Frostbite, ice running and masochism, welcome to the world of winter racing. Endless frozen plains, constant sub-zero temperatures and hurricane-strength winds, this race has literally reduced people to crawling. 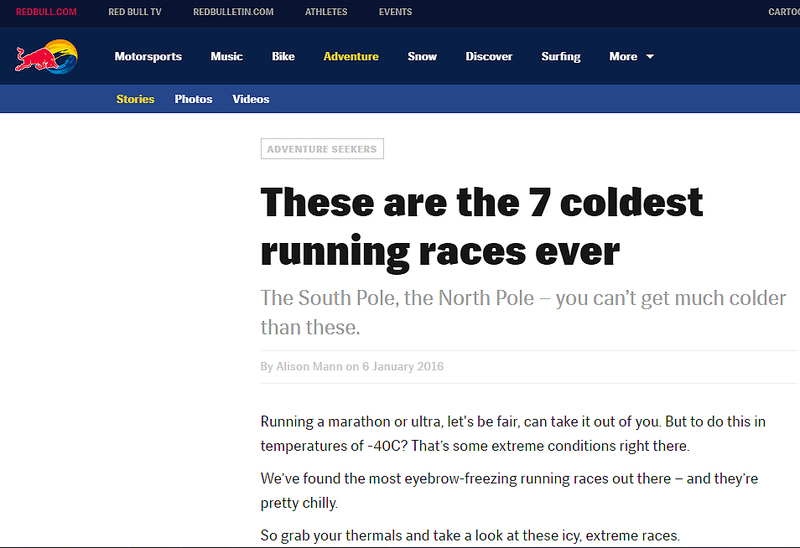 Named after the longitude/latitude of the point where the race enters the Arctic Circle, since the first edition in 2007, only 11 people have completed the course, so its claim to being the 'toughest, coldest and windiest extreme ultra marathon on the planet' doesn’t seem much of an overstatement. It starts from the Eagle Plains hotel on the Klondike Highway, pushes across the Arctic Circle to the Arctic Ocean, and runners do this all while dragging their supplies in a sled behind them. There's plenty of time to contemplate life. The Patrouille des Glaciers is a legendary high-mountain dash on skis across the mountains of Switzerland that was originally devised as a way to test the stuff of alpine soldiers during WW2. Revived in the 80s it's now a (heavily over-subscribed) classic endurance race. It begins in Zermatt, passes the shadow of the Matterhorn and finishes in Verbier some 53km and 4,000m of ascent later. Biting northern winds, harsh temperatures: welcome to the Russian outpost of Siberia, famed for its hostile environment – just the place for a race. Lake Baikal is the world's seventh largest lake in the world and contains 20 per cent of the world's water. Just don't fall in it. Taking a shot of vodka before the Baikal Ice Marathon is a traditional ritual to help pacify the spirits of the great lake. It's fair to assume it's not something your endurance scientist is going to recommend though. This man is Russian and clearly very hard. The Vasoloppet is the oldest, longest, and one of the biggest cross-country ski races in the world. Every year 16,500 participants take part, skiing from Sälen to Mora, traversing forests, hills, and frozen lakes fuelled on traditional reindeer stew given to racers the night before. The race was first run in 1922, inspired by the journey of King Gustav Vasa's 1520 flight from the King of Denmark. Finish and you'll feel like a king too. But the cut off times are ruthless and anyone going too slow will be pulled up. The Last Desert is a 250km run in Antarctica held over seven stages. Travelling in Antarctica is only for the most diehard suffer junkies. Expect temperatures as low as -40 degrees and an exhausting and never-ending battle to keep going – both mentally and physically. The Last Desert is a 250km run in Antarctica. Want to experience the best of Red Bull Adventure anytime? Find us on Facebook.